The airborne Stratospheric Observatory for Infrared Astronomy (SOFIA) observed a mini-eclipse of the extrasolar planet GJ 1214b. The goal was to find out if this world outside of our solar system is a super-sized Earth or a miniature Neptune. It was the first time SOFIA did observations of this kind and it was demonstrated that SOFIA can indeed help answering questions like this in the future. When I first saw SOFIA, I was an undergrad student at Cologne University in Germany: a poster at the Astrophysics Institute was advertising science with the ‘Stratospheric Observatory for Infrared Astronomy’ — a crazy sounding idea of NASA and the German Space Agency DLR to put a 2.5 meter telescope on board of a Boeing 747-SP Jumbo Jet. Astronomical observations from the ground, even on the highest mountains, suffer a lot from disturbing effects of the Earth’s atmosphere. 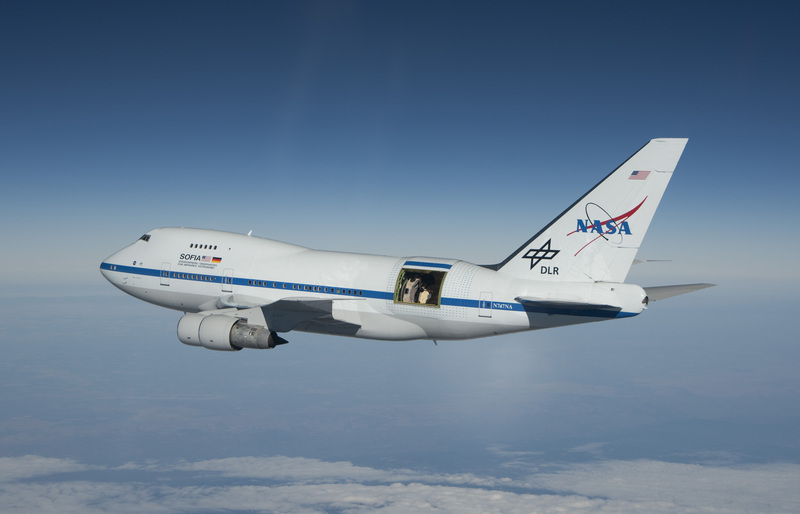 Flying slightly higher than commercial airplanes with SOFIA makes that much less of a problem – SOFIA, in that sense, is a space telescope that comes home every morning. At that time Cologne University was involved in building astronomical instruments that were supposed to fly on SOFIA, which was still in development. Undergrad me thought how cool it would be to maybe one day tighten a screw on a camera that will fly on NASA747 (SOFIA’s call sign) to the stratosphere or just being involved in another way with that fascinating mission. Fast forward through my undergrad, PhD and 2 postdocs to 2017: I am sitting here writing NOT about my screw but actually my-freakin’-self flying with SOFIA: “Last night I flew on a billion dollar NASA plane to observe an Alien world 42 light years away. 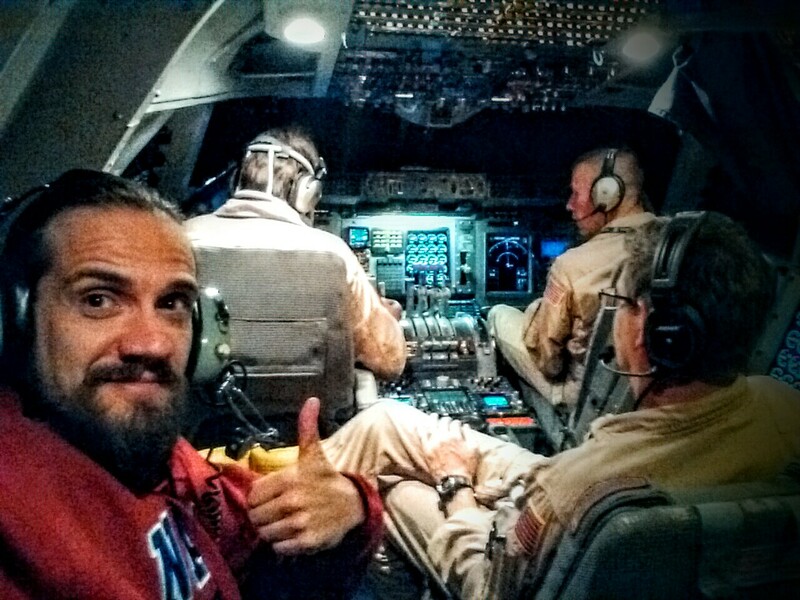 How was your night?” was what I tweeted when I got off the plane the next morning after our observation. 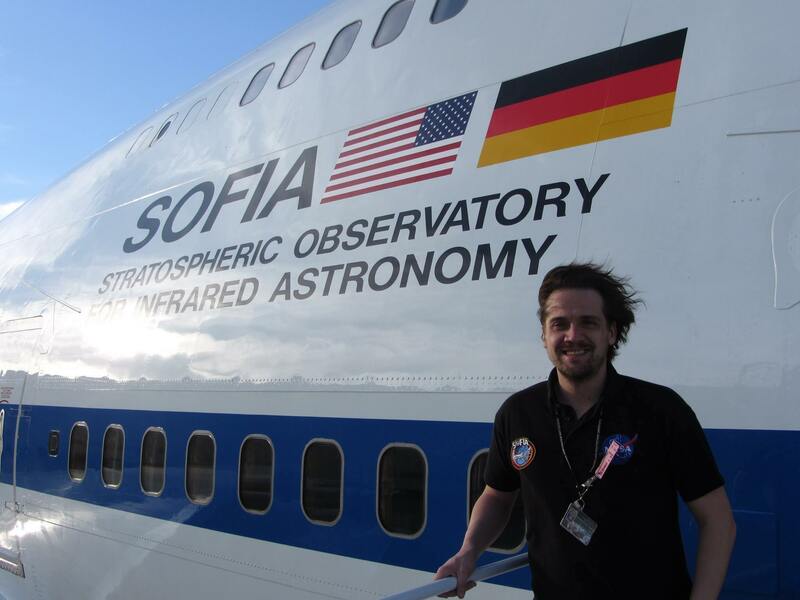 It wasn’t the first time I flew on SOFIA (I had done 2 or 3 test flights before), but it was the first time that we could use all the instruments available on SOFIA for the science that I am interested in: transits of extrasolar planets. These relatively rare events occur when a planet outside our solar systems lines up between Earth and its host star. During this phase the planet not only occults parts of the star making it slightly dimmer (like a mini eclipse), but also some of the light of the star passes through the atmosphere of the planet all the way to us. When we collect that light it can tell us about the composition, temperature, pressure and other characteristics of that planet’s atmosphere. However, when we observe these transits from the ground, even from the best sites in Chile or Hawaii, the light does not only pass the exoplanet’s but also a lot of Earth’s atmosphere, compromising our measurements. That is why getting high on SOFIA is so important for this science case. Our target that night was GJ 1214 b, a so called ‘mini-neptune’ or ‘super-earth’, a relatively common class of intermediate sized exoplanets, for which we do not have an analog in the solar system. And our observation was – besides testing and preparing SOFIA – indeed designed to give some more data for the theorists to figure out, if GJ 1214b is more of a blown-up, rocky world or a gaseous or icy, shrunken Neptune. As usual if one tries things for the first time, there were some problems here and there, that we learned to avoid or fix for future observations. But we were still able to push the instruments to 1.5-2 times their theoretical limit. While our results gave a few more clues but no ultimate answer to the questions about our target planet they showed that SOFIA has the sensitivity to play with the other kids in the exoplanet transit league like the Hubble or Spitzer space telescopes in the future. While SOFIA will most likely not become a work-horse starting player like these two, it can very well come off the bench for some tricky kicks or special plays that only SOFIA with its set-up is able do. For me and the hundreds of thousands of screws on board of SOFIA this means hopefully a lot more exoplanet hunting in the stratosphere in the future. Daniel Angerhausen from the Center for Space and Habitability (CSH) of the University of Bern.